Goya Toledo helped Vogue España celebrate its 30th anniversary with a party held at Casa Velazquez on Thursday (July 12) in Madrid, Spain. We don’t see the Spanish actress that often on the red carpet, and when we do, she’s usually decked out in Elie Saab. On this occasion she opted for she sweet elegance of Carolina Herrera. 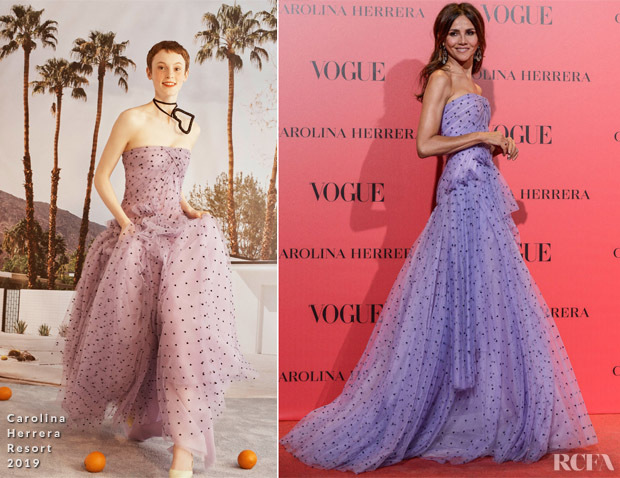 Her fairytale moment was delivered via this lilac polka dot dreamy strapless gown which probably should’ve been saved for awards season or one of the European Film Festivals, but you’ll get no complaints from me, as I would adore seeing this look in any setting. If you’re having a case of deja vu, that possibly due to the fact that Brie Larson wore a similar dress from Resort 2019 collection.